This is my first Elizabeth Peter’s book. It was a selection for the Cozy Mystery Corner group at Goodreads last month but I just got to it now. My library has a rather large selection of the books in this series. I am glad that I got to this book. Amelia Peabody is a fantastic character, as are Evelyn and Mr. Emerson. They are well developed three dimensional characters, The plot was well developed with a lot of depth through the details and description. 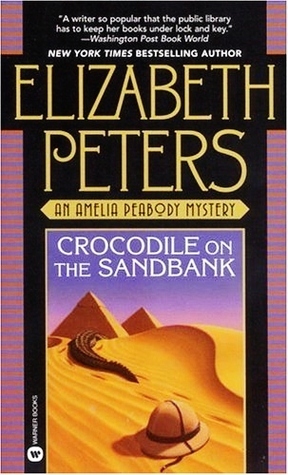 Ms. Peters skillful writing immersed me as a reader in Amelia’s adventures. The humor is well done. It doesn’t overwhelm the story or become ridiculous. In humor, mood, and some characterizations, the book reminds me of the series of Mummy movies starring Brendan Fraser and Rachel Weisz, which I loved. Great cozy mystery that reads more like an adventure. I will definitely read more in this series. This was recently recommended to me, but I always get intimidated by series that are SO LONG!!! Glad to see you enjoyed it.